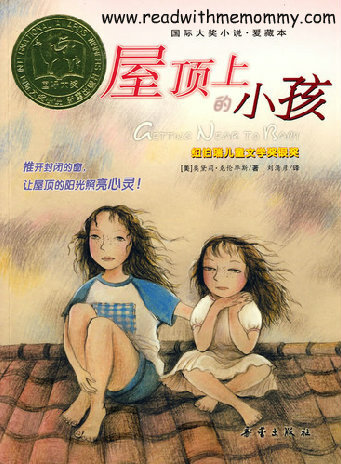 Getting Near to Baby is a children's novel written by Audrey Couloumbis that was awarded a Newbery Honor in 2000. This novel is the chinese translation. In the novel, the characters Willa Jo and Little Sister are dealing with their grief after the death of their baby sister. Their mother is unable to handle her own feelings of sadness while caring for the two girls, and sends them to stay with her sister, Patty. Aunt Patty has no children, and her household is full of rules. When Willa Jo and Little Sister climb up on Aunt Patty's roof to watch the sun rise, then decide not to come down for a while, Patty realizes that she hasn't been fulfilling the girls' emotional needs. Willa Jo reflects on her memory during her time at her Aunt Patty's house, like meeting Liz, the Piggly-Wiggly pickle, and much more.